Minimally invasive glaucoma surgeries are currently becoming prevalent. Trabeculotomy, classically performed with the “ab externo” approach, can also be performed with clean a corneal approach in consideration of recent developments. 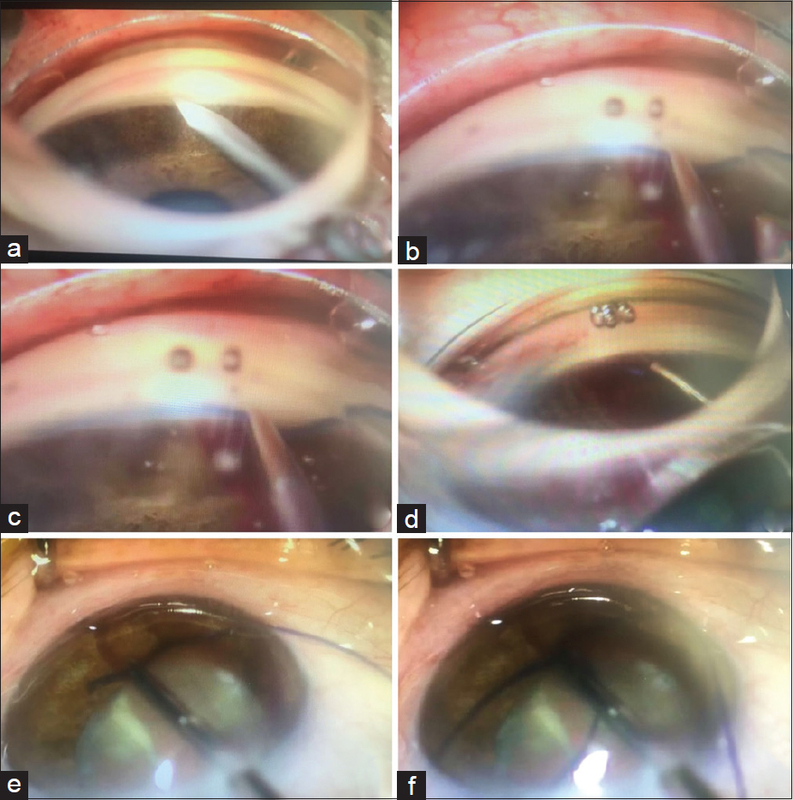 The most significant advantage of this method, termed as gonioscopy-assisted transluminal trabeculotomy (GATT), is the ability to perform trabeculotomy without any conjunctival or scleral incisions. This approach both decreases the incidence of postoperative complications and protects the conjunctiva and sclera for possible subsequent filtration surgeries. GATT is a surgery with a learning curve, and requires expertise in angle structures and gonioscopy. In experienced hands and convenient cases, high success rates have been reported.,, In this study, the safety, success, and complication rates of GATT combined with phacoemulsification and intraocular lens (IOL) implantation surgery were evaluated. The files of 32 patients who underwent GATT combined with phacoemulsification and IOL implantation surgeries between November 2015 and August 2017 were reviewed retrospectively. Only patients with primary open angle glaucoma (POAG) were included. Patients with other types of glaucoma, as well as patients who had prior laser treatment, glaucoma surgery, or vitrectomy were excluded. The data on age; preoperative and final visual acuity; intraocular pressure (IOP) preoperatively and 1st week, 1st month, 3rd months and 6th months postoperatively; the number of antiglaucoma medications used preoperatively and postoperatively; and postoperative complications were collected. Using these data, the differences in IOP and in the number of medications used postoperatively compared to the preoperative period were evaluated. A need for reoperation, a lack of a decrease in the number of medications used, and an IOP greater than 21 mmHg or deep hypotony 6th months postoperatively were considered to indicate surgical failure. The research followed the tenets of the Declaration of Helsinki and was approved by the Ethics Committee of University. All patients were operated under local anesthesia by the same surgeon (M.B.). Corneal incisions were formed in the inferonasal/superonasal and temporal quadrants with a 20-gauge stiletto knife. After the ocular viscoelastic device was injected into the anterior chamber, an incision (goniotomy) of approximately 1–1.5 mm was formed in the angle under indirect gonioscopy using a direct gonioscopy lens (Swan Jacob) through a temporal incision [Figure 1]a. A 5/0 prolene suture inserted from the inferonasal/superonasal incision to the anterior chamber was grasped and inserted into the goniotomy with the microforceps introduced into the anterior chamber from the temporal incision [Figure 1]b. The 5/0 prolene suture was pushed forward along Schlemm's canal circumferentially 360 degrees [Figure 1]c. Subsequently, the distal edge of the suture, that protruded from the goniotomy, was held [Figure 1]d, and 360-degree trabeculotomy was performed by pulling the proximal edge out of the temporal incision (traction) [Figure 1]e and [Figure 1]f. In 10 cases, because the suture could not be pushed forward, 180- or 270-degree trabeculotomy was performed instead of 360-degree trabeculotomy. In all patients, phacoemulsification and IOL implantation were performed after GATT, and an IOL was placed in the posterior chamber in the bag. Postoperatively, steroid drops and antibiotic drops were prescribed to the patients. Steroid drops at gradually reducing doses were used for approximately 4 weeks, and antibiotic use was stopped in the first week postoperatively. Postoperative follow-ups were performed at the 1st week, 1st month, 3rd month, and 6th month post-surgery. At every visit, visual acuity, IOP, and the number of antiglaucoma medications used were recorded. The data on age, visual acuity, IOP, and the number of medications used were expressed as means and standard deviations. The type of glaucoma, the decrease in IOP and the number of medications used, as well as complications were expressed as percentages. The postoperative IOP, visual acuity, and the number of medications used were compared to the preoperative values with the paired-sample t- test. P values below 0.05 were considered statistically significant. The average age of the 32 patients who underwent GATT combined with phacoemulsification and IOL implantation surgery at the Department of Ophthalmology, Faculty of Medicine, Uludag University (Bursa, Turkey) between November 2015 and August 2017 was 65.2 ± 14.8 years (range: 32–82 years). The type of glaucoma was POAG in all 32 patients. The patient characteristics are presented in [Table 1]. 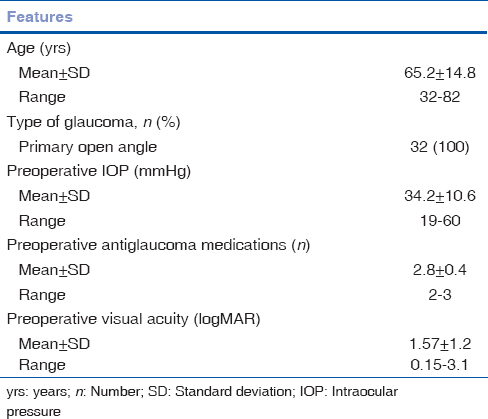 The average preoperative visual acuity of the patients was logMAR 1.57 ± 1.2. The average postoperative visual acuity was logMAR 0.39 ± 0.38. A significant increase in visual acuity was detected post-surgery (P < 0.05). 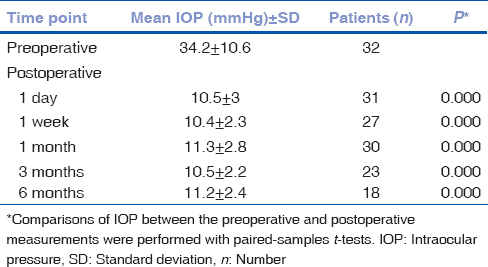 The average preoperative IOP was 34.2 ± 10.6 mmHg. The decrease in the average postoperative IOP was 24.5 ± 10.5 mmHg (68.2 ± 10.4%) on the 1st day, 22.3 ± 8.9 mmHg (66.7 ± 9.3%) in the 1st week, 23 ± 10.1 mmHg (65.1 ± 10.9%) in the 1st month, 21.7 ± 8 mmHg (66.3 ± 7.3%) in the 3rd month, and 24.3 ± 11.7 mmHg (65.9 ± 10.7%) in the 6th month. Compared to the preoperative period, IOP was significantly lower at all postoperative follow-ups (P < 0.05) [Table 2]. The numbers of antiglaucoma medications and active ingredients used were reduced significantly in the postoperative period compared to the preoperative period (both P < 0.05) [Table 3]. The average decrease in the number of antiglaucoma medications was 2.7 ± 0.6, and the average decrease in the number of active ingredients was 3.5 ± 0.8. The most frequent complication was hyphaema. In 10 of the 32 patients (31.2%), hyphaema was observed, but due to the limited severity of this complication, no layer of blood formed in the anterior chamber. Hyphaema was resolved within a maximum of 1 week. Prolonged hyphaema did not develop in any patient. Transient IOP spikes did not occur in any patient. Complications reported previously, such as Descemet's membrane detachment, corneal edema, and iridodialysis, were not observed. During the follow-up examinations, cystoid macular edema emerged in one patient, which was considered to be relevant to the present retinal vein occlusion in the patient. Deep hypotony developed in only one patient (3.1%); in this case, the surgery was considered to have failed. No patients required reoperation. “Ab interno” glaucoma surgeries do not require conjunctival dissection and allow for possible subsequent filtration surgeries. “Ab interno” methods can be roughly categorized into three types: subconjunctival, suprachorodial, and Schlemm's canal approaches. In the “ab interno” methods with Schlemm's canal approach, the aqueous humour in the anterior chamber is drained through Schlemm's canal and collector canals. Trabectome (Neomedix, Tustin, CA), iStent (Glaukos Corporation, Laguna Hills, CA), Hydrus (Ivantis, Irvine, CA), excimer laser trabeculostomy, and GATT are the “ab interno” methods that provide drainage to Schlemm's canal and collector canals. GATT was defined by Grover et al. in 2014. In this method, 360-degree disruption of the trabecular meshwork was not performed “ab externo,” as it had been defined previously; instead, it was performed “ab interno” under gonioscopy via temporal and superonasal/inferonasal paracentesis with a microcatheter or suture. The main advantage of this method is the ability to perform trabeculotomy without conjunctival and scleral incisions. This technique provides protection of the conjunctiva and sclera for possible filtration surgeries, if necessary. Trabeculotomy (GATT and “ab externo”) can be safely performed on all glaucoma types except for closed-angle glaucoma. In POAG patients who underwent GATT, Grover et al. reported a decrease of 7.7 ± 6.2 mmHg (30 ± 22.7%) in IOP and a decrease of 0.9 ± 1.3 in the number of the medications used in the 6th month postoperatively, as well as a decrease of 11.1 ± 6.1 mmHg (39.8 ± 16%) in IOP and a decrease of 1.1 ± 1.8 in the number of the medications used in the 12th month postoperatively; in the secondary glaucoma group, they reported a decrease of 17.2 ± 10.8 mmHg (52.7 ± 15.8%) in IOP and a decrease of 2.2 ± 1.5 in the number of the medications used in the 6th month postoperatively as well as a decrease of 19.9 ± 10.2 mmHg (56.8 ± 17.4%) in IOP and a decrease of 1.9 ± 2.1 in the number of the medications used in the 12th month postoperatively. The rate of failure was 9% (8 patients out of 85). Rahmatnejad et al. reported in POAG group a decrease of 10.4 ± 9.4 mmHg (42.4%) in IOP in the 6th month postoperatively and 9.3 ± 10.8 mmHg (38%) in IOP in the 12th month postoperatively; in the non-POAG group, a decrease of 16.6 ± 15.8 mmHg (54.6%) in IOP in the 6th month postoperatively and a decrease of 18.6 ± 10.7 mmHg (61.2%) in IOP in the 12th month postoperatively. The overall success rate was 63.0%. In the current study, only POAG patients were enrolled; at the end of the 6th month post-surgery, the average IOP was 11.2 ± 2.4 mmHg and the average number of antiglaucoma medications used was 0.2 ± 0.4. In addition, in the 6th month postoperatively, decreases of 24.3 ± 11.7 mmHg (65.9 ± 10.7%) in the average IOP and 2.7 ± 0.6 in the average number of antiglaucoma medications used were observed. The failure rate was 3.1%. In the current study, a more significant IOP decrease was obtained than that in the other studies because POAG patients with higher preoperative IOP were enrolled. Grover et al. also indicated lowest failure rates in combined cataract extraction and GATT patients in both POAG and secondary glaucoma groups. In their study, phakic patients and patients with prior cataract extraction required more subsequent glaucoma surgery in comparison to patients who underwent combined surgery. The possible reason of this situation was explained by the authors using fluid dynamics. It is known that postoperative complications such as bleb leaks, hypotony, shallow anterior chamber, and choroidal detachment occur less often in trabeculotomy than that in trabeculectomy, similar to other nonfiltrating surgeries. The results of the current study also support this perspective. In the current study, only one patient with POAG developed deep hypotony, which was considered to be a surgical failure. During the follow-ups, to recover that patient's IOP to the normal level, topical and oral steroid application, subtenon steroid injection, and administration of autologous serum into the anterior chamber were attempted. However, deep hypotony could not be avoided with any of these treatments. Cataract surgery reduces IOP through several mechanisms. The anatomic changes occurring in the anterior chamber, the changes in the trabecular meshwork induced by inflammation and ultrasonic vibrations, and increased traction on zonules are a few of these mechanisms resulting in an increase in outflow. Whether cataract surgery combined with GATT has an additional IOP-decreasing effect is controversial. Grover (“ab interno”) and Shinmei (“ab externo”) did not detect any significant difference in the IOP decrease between the trabeculotomy and combined surgery groups in their studies., Chiara et al. noted that combined “ab externo” trabeculotomy and cataract surgery provided a further decrease of 1–2 mmHg in IOP compared to trabeculotomy alone. Tanito et al. in their study evaluating patients who underwent combined surgery determined the rates of cases with an IOP under 21 mmHg, 17 mmHg, and 15 mmHg at the end of one year post-surgery to be 95.8%, 58.7%, and 30%, respectively. In the current study, only patients who underwent GATT combined with cataract surgery were evaluated. Because no comparison to the patients who underwent GATT alone was made, no data on whether cataract surgery had any additional positive effect on the IOP decrease were collected. In the current study, the IOP of all patients was under 15 mmHg in the 3rd and 6th months postoperatively. Hyphaema and transient IOP spikes are the most common complications that develop after trabeculotomy., Hyphaema emerges when Schlemm's canal is filled with blood due to reflux from episcleral veins after the circumferential rupture of the trabecular meshwork. Transient IOP spikes are related to prolonged hyphaema and can be eliminated by washing out the anterior chamber., Descemet's membrane detachment, corneal edema, iridodialysis, and cystoid macular edema are among the complications that may emerge after trabeculotomy. Combined surgeries have some disadvantages, such as longer operation duration, slower visual recovery, and more difficult IOP control due to higher inflammation levels in the postoperative period. In cases of cataract surgeries combined with trabeculectomy, the rates of postoperative complications such as hypotony, bleb leakage, shallow anterior chamber, choroidal detachment, hyphaema, and sclerostomy site blockage were demonstrated to be increased in several previous studies. However, this case is not valid for trabeculotomy. Inatani et al. expressed that hyphaema and transient IOP spikes, which were observed frequently with trabeculotomy alone, were observed less often with combined surgeries. The reasons for this finding were reported to be washing out the blood reflux during the cataract surgery and avoiding reflux from episcleral veins, depending on the occurrence of high pressure in the anterior chamber. In their study comparing combined surgery to trabeculotomy alone, Shinmei et al. underlined that there was no significant difference between the two groups in terms of complications, and that the two groups were equal in terms of safety. In the current study, hyphaema (31.2%) was the most frequent complication; however, this complication did not cause any IOP increase in any of the patients, and it did not require anterior chamber lavage. Hyphaema was resolved via topical treatment within a maximum of 1 week. If it is performed on convenient patients, GATT effectively provides a decrease in IOP. While performing GATT in the same session with cataract surgery does not reduce the effectiveness of GATT, the combined surgery decreases the incidence of complications, especially hyphaema. Therefore, GATT combined with cataract surgery is a surgical procedure that can safely be performed on convenient patients. All authors contributed to the design of the work; the acquisition, analysis, or interpretation of data for the work and drafting the article. The manuscript has been read and approved by all the authors, that the requirements for authorship have been met, and each author believes that the manuscript represents honest work. Grover DS, Godfrey DG, Smith O, Feuer WJ, Montes de Oca I, Fellman RL. Gonioscopy-assisted transluminal trabeculotomy, ab interno trabeculotomy: Technique report and preliminary results. Ophthalmology 2014;121:855-61. Grover DS, Godfrey DG, Smith O, Shi W, Feuer WJ, Fellman RL. Outcomes of gonioscopy assisted transluminal trabeculotomy in eyes with prior incisional glaucoma surgery. J Glaucoma 2017;26:41-5. Grover DS, Smith O, Fellman RL, Godfrey DG, Butler MR, Montes de Oca I, et al. Gonioscopy assisted transluminal trabeculotomy: Ab interno circumferential trabeculotomy for the treatment of primary congenital glaucoma and juvenile open angle glaucoma. Br J Ophthalmol 2015;0:1-5. Rahmatnejad K, Pruzan NL, Amanullah S, Shaukat BA, Resende AF, Waisbourd M, et al. Surgical outcomes of gonioscopy-assisted transluminal trabeculotomy (GATT) in patients with open-angle glaucoma. J Glaucoma 2017:26:1137-43. Grover DS, Smith O, Fellman RL, Godfrey DG, Gupta A, Montes de Oca I. Gonioscopy assisted transluminal trabeculotomy. J Glaucoma 2018:27:393-401. Shinmei Y, Kijima R, Nitta T, Ishijima K, Ohguchi T, Chin S, et al. Modified 360-degree suture trabeculotomy combined with phacoemulsification and intraocular lens implantation for glaucoma and coexisting cataract. J Cataract Refract Surg 2016;42:1634-41. Chiara E, Nishida A, Kodo M, Yoshimura N, Matsumura M, Yamamato M, et al. Trabeculotomy ab externo: An alternative treatment in adult patients with primary open-angle glaucoma. Ophthalmic Surg 1993;24:735-9. Tanito M, Ohira A, Chihara E. Surgical outcome of combined trabeculotomy and cataract surgery. J Glaucoma 2001;10:302-8. Inatani M, Tanihara H, Muto T, Honjo M, Okazaki K, Kido N, et al. Trasient intraocular pressure elevation after trabeculotomy and its occurence with phacoemulsification and intraocular lens implantation. Jpn J Ophthalmol 2001;288-92. Johnson SM. Combined cataract and trabeculectomy surgery. In: Johnson SM, editor Cataract Surgery in the Glaucoma Patient. Springer, LLC; 2009. p. 59-71.